Casper van der Valk is a PhD Fellow at RMC in Utrecht, The Netherlands, and works with 3D bioprinting and regenerative medicine. He has been using our INKREBILDE+ bioprinter to study models for human calcific aortic valve disease. The text below is provided by Casper van der Valk, which is based on his publication named “Engineering a 3D-Bioprinted Model of Human Heart Valve Disease Using Nanoindentation-Based Biomechanics” in Nanomaterials. Modelling calcific aortic valve disease (CAVD) progression in vitro by recapitulating the aortic valve microenvironment and mechanical properties for human aortic valve interstitial cells (VICs). Microcalcifications in the aortic valve (AV) leaflet impair opening and closing of the valve. The interstitial cells inside the valve leaflets produce these microcalcifications. In order to study the pathobiology of the disease, a model that mimics this disease is needed. CAVD develops preferentially in the fibrosa layer of the aortic valve and extends into the spongiosa layer, as seen in the figure beside. Movat’s pentachrome staining of structural organization in a circumferential cross-section of a human AV leaflet. Yellow = collagen, blue = glycosaminoglycans (GAGs), black = elastin, dark brown/black = calcification: (Left) Tri-layered arrangement of the fibrosa (collagen-rich), spongiosa (GAG-rich), and ventricularis (elastin-rich) layers in a healthy leaflet; (Right) Disruption of the leaflet layers by calcifications (black) and fibrosis (yellow regions) in CAVD; Scale bar 50 µm. By 3D printing hydrogels and valve interstitial cells, we constructed a microenvironment for these cells that mimics the native environment in the valve. Contrary to traditional 2D tissue culture, these cells now behave similar to the way they behave in the native valve. By stimulating these cells to differentiate pathologically we can replicate disease progression. 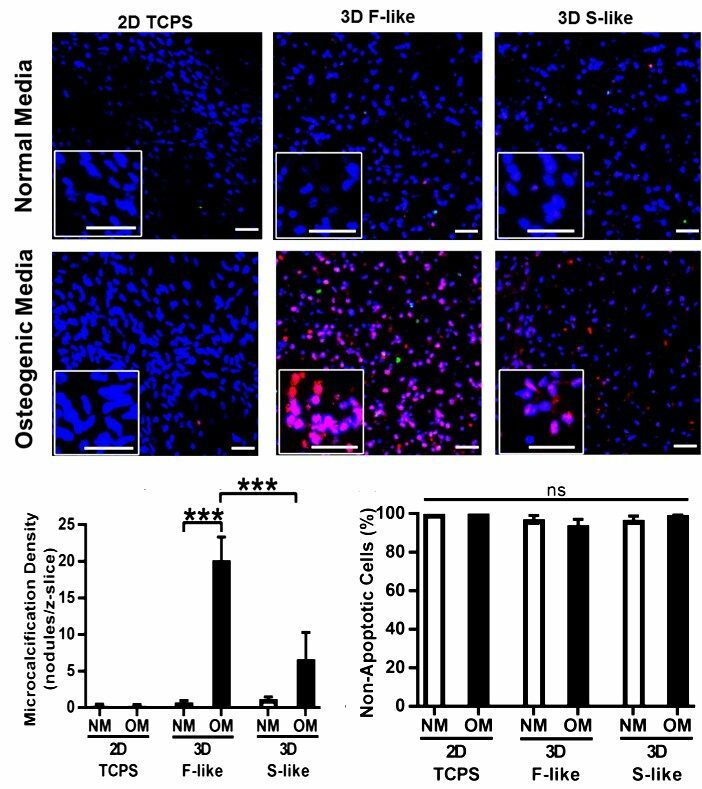 Cells in the 3D bioprinted constructs produce microcalcifications when exposed to Osteogenic Media (OM), while maintaining high cell viability. 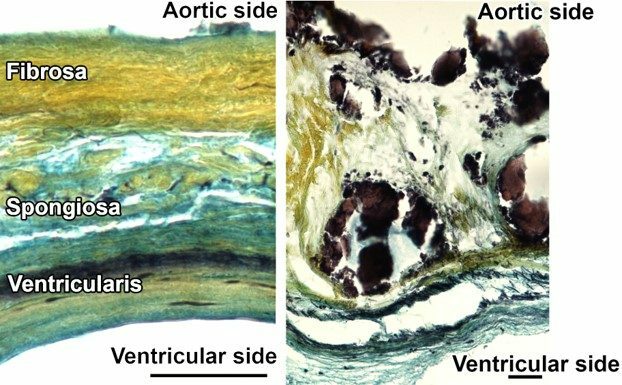 Microcalcifications develop more readily in the hydrogel that mimics the mechanical properties of the fibrosa layer of the aortic valve (F-like hydrogel), than in the hydrogel that mimics those of the spongiosa layer (S-like hydrogel). Fibrosa-like hydrogels preferentially induced production of osteogenic microcalcification by VICs. Red = NIRF Osteosense 680 imaging agent (nano- and microcalcifications), green = TUNEL apoptosis assay, blue = Hoechst nuclear stain: (Top) VICs isolated from non-diseased human AV did not undergo calcification when cultured in NM on/in either 2D tissue culture polystyrene (TCPS), 3D fibrosa-like (F-like) hydrogels, or 3D spongiosa-like (S-like) hydrogels (representative images); (Middle) Under OM treatment this naïve VIC population developed significant production of microcalcification only in 3D F-like hydrogels that mimic the biomechanics of the disease-prone layer of the native tissue. OM treatment did not induce significant microcalcification on 2D TCPS or in 3D S-like hydrogels. (Bottom) Quantitative representation of microcalcifications, left, and apoptosis, right, in all conditions. Apoptosis was negligible and unchanged across all conditions, confirming that apoptotic cell death was not the source of preferential calcification in OM-treated F-like hydrogels. Mean + SEM; *** p < 0.001; n = 3 samples per condition (3 images per sample); scale bar = 50 µm. This model replicates CAVD in vitro and can be used to 1) study CAVD pathobiology to identify therapeutic targets, 2) test novel therapeutics (in a high through-put fashion), and 3) be a stepping-stone towards 3D bioprinted tissue-engineered heart valves. All images originate from van der Valk, D.C.; van der Ven, C.F.T. ; Blaser, M.C. ; Grolman, J.M. ; Wu, P.-J. ; Fenton, O.S. ; Lee, L.H. ; Tibbitt, M.W. ; Andresen, J.L. ; Wen, J.R.; Ha, A.H.; Buffolo, F.; van Mil, A.; Bouten, C.V.C. ; Body, S.C.; Mooney, D.J. ; Sluijter, J.P.G. ; Aikawa, M.; Hjortnaes, J.; Langer, R.; Aikawa, E. Engineering a 3D-Bioprinted Model of Human Heart Valve Disease Using Nanoindentation-Based Biomechanics. Nanomaterials 2018, 8, 296. https://doi.org/10.3390/nano8050296 under the Creative Commons Attribution License.